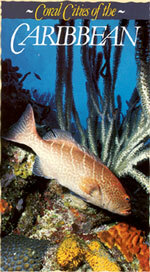 Take a journey of discovery among the coral reefs of the Caribbean. Watch the various fishes and invertebrates that reside in these coral cities as they follow their clever strategies for survival. Filmed beneath the waters of Little Cayman Island, a diving Mecca with rich, colorful coral reefs, Coral Cites of the Caribbean opens with a typical morning among the corals. We learn about how the stony corals build reefs of different types and about the conditions required for coral growth. Then we get close up and personal with the invertebrates of the reefs including: the brilliant sponges, the gently waving gorgonian soft corals, sea anemones, delicate tube worms, hermit crabs, octopuses, marine snails, sea stars, and urchins. We spy on colorful Caribbean fish, both predators and prey, examining the amazing strategies they use to protect themselves from "the big guys." We drift with sharks and barracudas, sometimes joining scuba divers as they explore the teeming coral cities. We visit the reef at night, plunging into a black void where an eagle ray soars over the corals under a full moon; we sneak up on sleeping fish and scavenging lobsters. Ultimately, we return to morning, having come full cycle. We then take a brief look at how reefs are damaged. The haunting "Diver’s Song" closes the presentation. "Coral Cities of the Caribbean" was filmed by Scott Munro, chief videographer for the international JASON project. It was written and narrated by Nancy Sefton, marine naturalist and 22-year resident of the Caribbean. Jim Church, Noted Author and Underwater Photographer: "... a valuable contribution to any diver's tape library and a source of new insights into the workings of the coral reefs we all love."